This week the Son’s school has reopened after summer vacation. I never have wanted him to get into such a structured life at only 3. with the commutation time he has to spend almost 6 hours outside. By the time he comes back at 1 P.M. he is all tired and often even falls asleep in the car. But with the nature of his father’s job we really din't have any other option. It almost breaks my heart to wake him at early morning. Though he loves his friends and the activities in the school but this morning routine annoys him. Every day he would request us to let him sleep for another minute and sometimes we feel bad for not indulging him. to top that getting back to the routine after a long vacation is always difficult. Just to prepare him for school we planned a day of activity with things that he likes to do. We went to a nearby mall where he spent some time playing with other kids in the play arena, ate his favourite burger, spent some more time with his cousin sister and while coming back asked me to make some honey bees for him. Recently he has started watching Winnie the pooh and every-time the fat bear drinks honey from the urn he laughs and claps. So honey bees to cheer my boy on some moist and flavourful honey cuppies this time. The recipe of the cupcakes is borrowed from the Jewish honey cake. Somehow I dint like the idea of too many flavours in a single dish so I chose only those which I thought will work well together. I have made this cake few times before and I must say this is one of those moist, flavourful and regal cakes that you want to bookmark and bake again and again. Line and prepare your muffin pan with muffin liners. Keep aside. If using a round pan then generously grease it and line with butter paper. Sieve flour, baking powder, baking soda, salt and cinnamon powder. Place everything in a big bowl. Separately whisk all the dry ingredients till mixed. Pour this in the dry and whisk to get a smooth, shiny homogenous batter. Pour till ¾ if your muffin cups. Bake for 25-28 minutes or till a toothpick inserted in the center comes out clean. Also check if it sprongs back when pressed lightly at the center. That’s the sign of a good moist honey cake. For round or square pans bake for 45-55 minutes. cool and later take out of the pan. serve warm or at room temperature. If storing, then wrap in cling foil and refrigerate. This recipe is very versatile. You can measure up or down the recipe to fit your requirement. If you want to frost it whip double cream till soft peaks and using a star nozzle cover the top. Decorate with fondant honey bees or with sprinkles. Goes to Nishas First giveaway of Cupcake Carrier at Spusht. Vardhini's Bakefest this month hosted at daily cuppa. Tickling palate's lets cook, kid's special. cupcake, cupcake recipe, cupcake recipes, cupcake cake, cupckae cakes, chocolate cupcake, cupcake ideas, cupcake frosting, cupcake bakery, birthday cupcake, honey cupcake, jewish honey cake recipe, how to bake jewish honey cake, best honey cake recipe, moist cake recipe, best and easy cupcake recipe, healthy cake recipe, diabetic cake recipe, cake recipe for diabetic patients, cupcake icing, cupcake toppers, how to make gumpaste honey bees, easy honey bee for cupcakes. cupcake frosting recipe. cupcake for kids, cupcake topper ideas, cute cuppies, cuppies recipe. honey muffin. 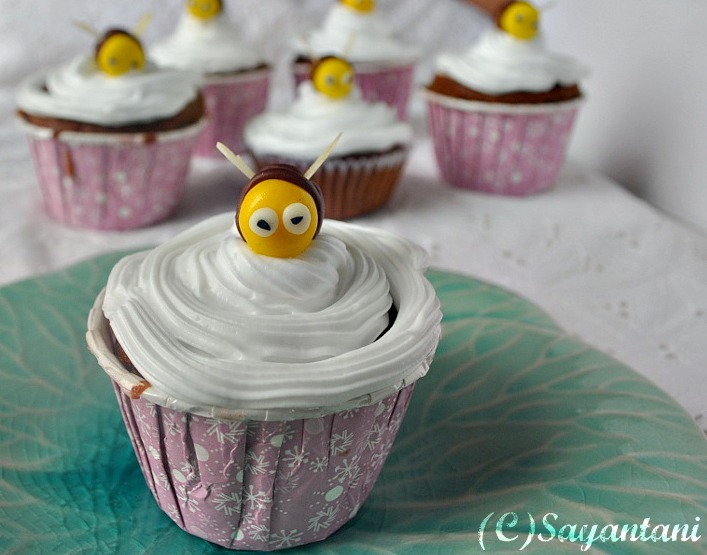 So delicious,moist and flavourful cake..loved the cute honey bees! Wow those cupcakes looks damn cute and attractive, i can have two cupcakes rite now even after having my dinner.Yummy. These look so sweet:) Absolutely perfect!! 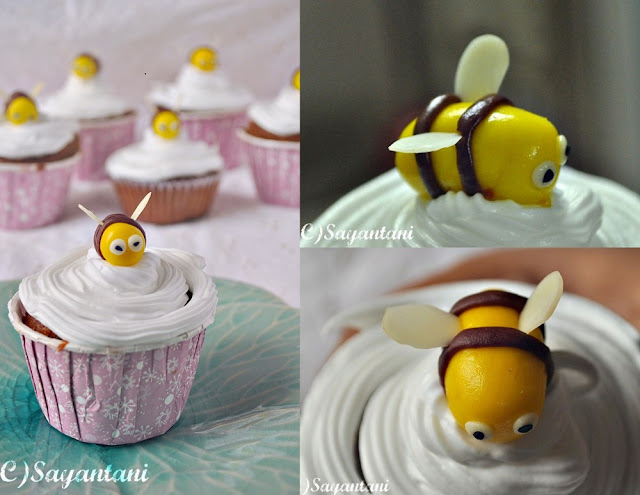 honey bee gulo onek cute hoeche and the frosting looks beautiful. Great job on the cupcake! My son's school is little late (9am) and I drop him everyday so commuting time is saved. Can imagine your plight of waking him early for his school. 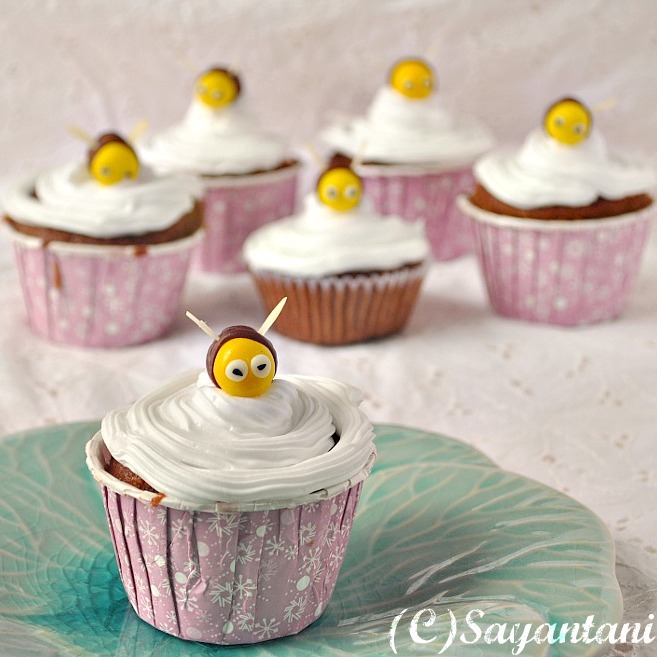 Oh My God what a lovely honey cup cakes.... They are superb... Even I too feel sad that here schools opens by early 7. When I was studying used to sleep till 8 n enjoy the sleep but this generation kids can't. Satayani, These cupcake looks so cute love that cute honeybee. OMG!This is such a cute cupcake. You always come up with such wonderful recipes. Keep up the good work. My 3 year old takes a 2 minute walk and is already in school. And still, she is all tired and hungry after the 3 hour activities. I can imagine your little boy after hours of travel. I am sure these cuppycakes will really cheer any kid up. Thanks for sharing! This is super cute....absolutely love the clicks too..
What an adorable looking cake!Looks soo cute and awesome! How cute are those honeybees! 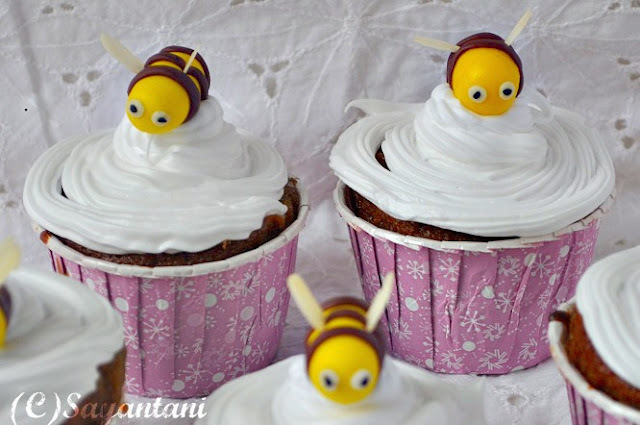 i bet your little one loved them :) and i've never tried a honey cupcake before and these look truly scrumptious. Bookmarked! 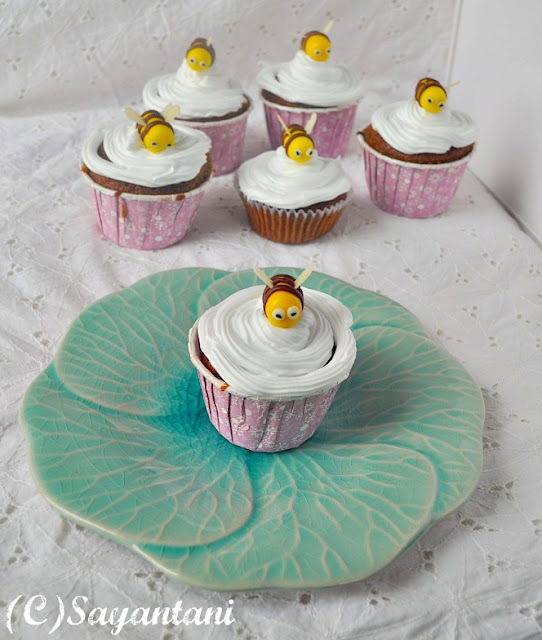 Oh my such cute honey bees ...... they look so adorable on those cup cakes. I am sure your lil one would have enjoyed them. I read your post interesting and informative. I am doing research on bloggers who use effectively blog for disseminate information.My Thesis titled as "Study on Blogging Pattern Of Selected Bloggers(Indians)".I glad if u wish to participate in my research.Please contact me through mail. Thank you. The color combination and very look of the muffins bring water to the mouth. Truely appetizing! wowwwwwwwwwww wanna grab the honeybeess perfectly done!!! 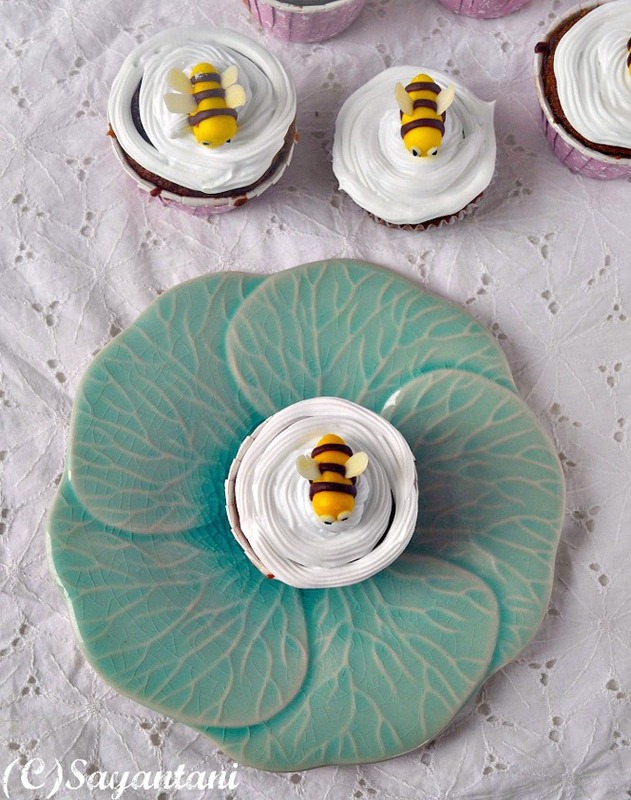 Perfect cupcakes love those honey bees. School life is certainly strenuous for any 3 years..but then our Indian education system is like that, he will come in terms with it soon. The cup cakes look so cute and hats off to your patience for the decoration. Wow this is amazing Awesome.